Thanks to the amazing guys over at Southtown Homebrew, I have been able to convert gunbird18's Fire Shark pcb to the very rare 1-player Japanese version, Same! Same! Same! - with his blessing of course! The US version, Fire Shark, has no side fields and makes for a tough and slightly boring game compared to Same! Same! Same!. While I do enjoy Fire Shark, Same! Same! Same! is much, much better. There are now side fields and different firing patterns for some of the bosses. 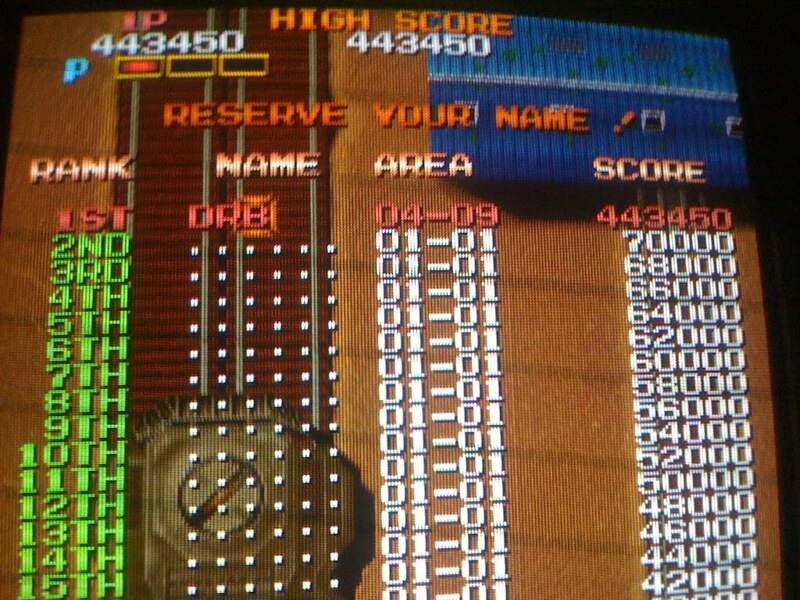 The game plays more maniacally and is a fast, rewarding shmup. None of the music changes, but the feel of the game is very, very different. 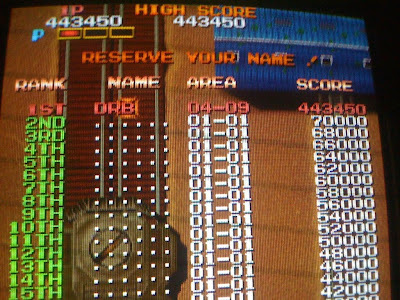 I have been at it for the last few days and set this high score at 443,450 at area 4-9. It's harder than Fire Shark, but more enjoyable. I can see why the original Japanese Same! Same! Same! 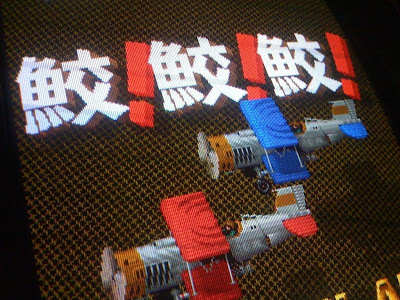 1-player boards command 5-60,000 Japanese Yen (roughly 650 USD). For those of you with Fire Shark pcb's - hit up Southtown for the roms. They'll run you $20 a set. So awesome to see that board now running Same!X3! You research the crap out of stuff and come up with some amazing ideas. :) No worries - I wanted to know if it could be done! Also - what the hell were they thinking of for the American market? The JP version is waaaaay better - and that's not just some snobbery! Thanks for posting about great old games like this! I've been wanting to pick this up for a while now a I love Toaplan games, but I wanted to know is it hard to change the Roms and once they are changed is it easy to change them back? Great post. Wanted to do this to my own Fire Shark, so put a couple of S!S!S! roms in my pcb, but it won't boot. Any other steps needed? I've had two sets of roms from southtown in it. Alexander - I did want to respond here in case someone else hits on this question in the future, even after we emailed on shmups. I assume there could be a few things happening here - the first being the pcb is in some way previously modified - or - that the voltage in the cab is wrong - some Toaplan stuff is very sensitive to voltages. This is all assuming you are placing the chips in their proper way and the chips aren't bad right from Southtown, but those guys seem to be super solid that way. The conversion I did was super easy - remove old chips, put in new chips. No other modifications. Hopefully by now you have a solution!